A seemingly humble two-hander from America takes on the world, teasing, prodding and ultimately assaulting audiences’ unease about race. 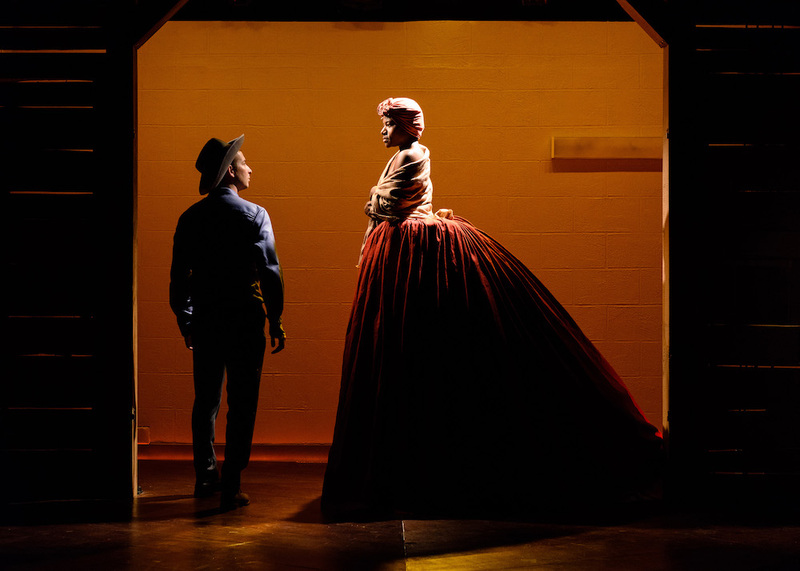 Declared among the best 25 American plays of the past 25 years by The New York Times, Underground Railroad Game begins in a very humble, even hokey way. A black woman sneaks fearfully into a barn, where she soon encounters a white man who is secretly helping her escape from slavery. With his stuck-on Quaker beard and corny lines, hints that she’s both not very bright and attracted to this man, and a basic set that’s as much made of cardboard as wood, it’s a relief when the lights come up and we discover it was a play within a play. Middle school teachers Caroline (Jennifer Kidwell) and Stuart (Scott Sheppard) snap back into ‘reality’ and contemporary clothes. With a cheerfulness spiced with a little disciplinary severity, they tell the class, we the audience, that we’re going to play a game inspired by the Underground Railroad, the clandestine network of safehouses that helped American slaves to freedom during the 19th century. Dolls representing slaves need to be moved to safehouse boxes by students randomly designated as Union soldiers, or intercepted by students designated Confederates. Points will be awarded, the total deciding whether history is reaffirmed or rewritten. Far from being a theatrical joke, this outrageous, insensitive educational concept is something that Sheppard actually had to participate in as a fifth grader. Our discomfort with the idea, and how far the audience participation will go (not far, as it happens), is just the beginning of a journey that teases, prods and ultimately assaults our unease about race. Underground Railroad Game, a two-hander created by Kidwell and Sheppard, no doubt has more impact with audiences at home in the United States, where the language and symbols of racism, especially the spectre of slavery, are different to Australia. American audiences would immediately know, for example, that the game’s safe word, ‘sojourner’, refers to 19th-century African-American abolitionist Sojourner Truth. Even so, surely no one can help squirming at least a little through this 75 minutes of daring theatre that goes from satire to sadomasochism. The teachers intermittently update the class-audience about the game’s progress, but for the most part we observe the romance that blossoms when they’re off duty. Caroline, a confident, forthright black woman, and Stuart, an earnest, liberal white man, seem a nice match. They dance, out of time and place, as if in an old-fashioned movie, to Sarah Vaughan singing Misty. A thoughtless comment by Stuart, however, reveals the racism lurking beneath society’s surface. Unresolved ideas about masters and slaves, black temptresses and white transgression bubble up, most powerfully in a fantasy scene in which Kidwell becomes the archetypal slave mammy, gracious, alluring and powerful, and a mesmerised Sheppard disappears under her massive scarlet skirt. This fetishistic eroticism boils over into sadomasochism in a final, confronting scene that leaves the actors physically and emotionally spent. And audiences perhaps thinking about that safe word. 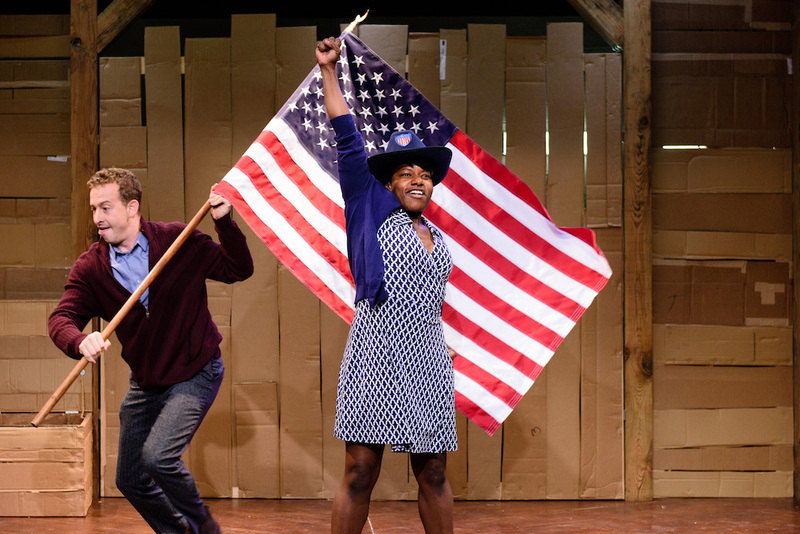 Underground Railroad Game is a little play that premiered in 2015 at a Philadelphia fringe festival, before moving onto New York, the UK and now Melbourne. With the barest of set, props and costumes, it speaks volumes about America’s struggle to understand let alone find the language to speak about the legacy of slavery and the racism that endures. It speaks volumes about the racism that endures everywhere. Cloudstreet is the centrepiece in a 2019 season steeped in horror, Malthouse AD Matthew Lutton explains. Queensland Theatre and Malthouse Theatre bring Osamah Sami’s absurd and affectionate memoir to Brisbane audiences. A director, writer and actor, she has previously worked with Malthouse in her capacity as an actor.